I come across this video shot by Nokia N8 and was very impressed with the video quality. The objects like trees are correctly and sharply focused at close-up. You gotta view the video at 720p to see how clear and astonishing it is. I’ve always been looking for a way to connect a phone and a camera without the need of a PC for instant sharing and backup. 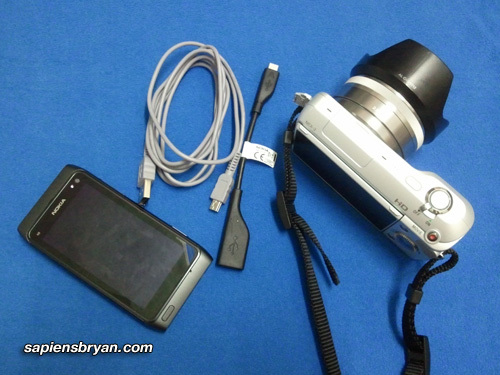 Finally, I found my answer 2 days ago when I had a crazy thought to connect my Nokia N8 to Sony NEX3 dSLR camera using USB On-The-Go. Nokia N8 has a cool feature called USB On-The-Go, which enables the user to connect the phone to USB storage devices such as thumb drive, mobile phone, etc. So, I thought why not try to connect the N8 to my camera and see if they recognize each other. To my surprise, both devices connected without a problem and the N8 was able to read all files in the camera. I love to travel and one of the problems I always have while traveling is to worry that my camera will run out of storage space. With the USB On-The-Go feature of Nokia N8, I don’t have to worry about this problem anymore because I can now backup my photos from Sony NEX3 to the phone’s 16GB storage (expandable to 48GB) without the need of a PC or laptop. On top of that, I can instantly share any photo in my camera across the Internet via Twitter, Flickr or Facebook directly from the storage of the camera as well! How often after you snapped an amazing picture with your digital camera but found out that you can’t tweet it from the digital camera? Now you can, using Nokia N8! 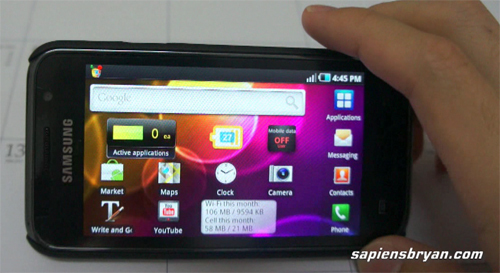 You like this cool feature of Nokia N8 too? I Won The Nokia N8 Make My App Competition! This piece of fantastic news is indeed the best news so far in this year. 1. The phone user speaks to the phone in foreign language. 2. The phone translates the spoken words into English by utilizing its voice recognition and language translation feature. 3. The phone sends a query to dictionary.com or Google Dictionary for the voice pronunciation of the translated words. 4. The dictionary.com or Google Dictionary server returns the voice output to the phone. 5. The phone will output the translated words in voice to the user. More than 6,000 ideas were submitted in this Make My App competition, 90 got shortlisted, then the final 13 were selected by the judges. I would like to thank all of you who have voted because my idea won’t get shortlisted without your votes. Thanks a lot for making it a reality! The prizes for winning the competition is a Nokia N8 loaded with all these proposed applications and a trip to London to attend Nokia World Event 2010 on 13th-15th September 2010. I can’t wait to see all these winning applications running in Nokia N8. Stay tuned for more first hand news about Nokia World Even 2010 and Nokia N8 from me by either following me (@sapiensbryan) in Twitter or subscribing to my blog feeds.